﻿Giant walls that go down into the abyss, amazing drop offs, immense sharp rocks, caves, underwater canyons, large sand bars, and arches – all of this makes up a spectacular landscape decorated with a thousand different types of life. 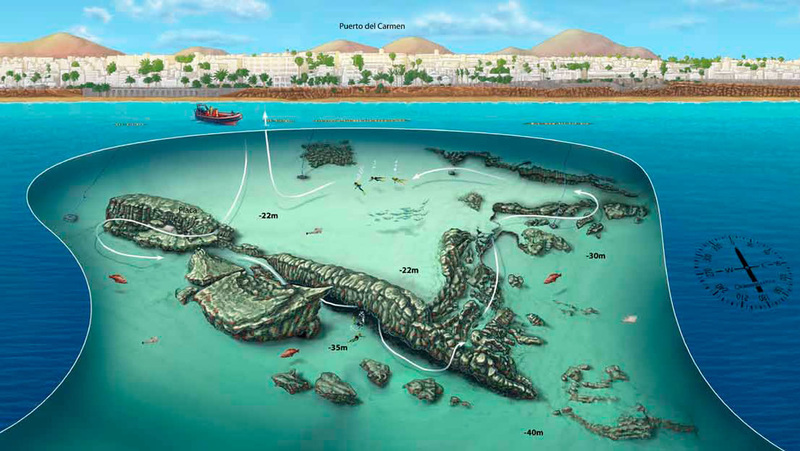 The landscape is one of the strong points of this dive because of how varied it is. The nooks in the rocks shelter two orange corals and one small cave that is blanketed with narval shrimps. A great variety of other species can also be seen.The dive begins right at the line of buoys that mark the beach swimming area. Once at the bottom, descend down the sand to the small arch formed in the rock that a diver can fit through. From there, follow the cliff leaving it to the right. Just a few meters away, you will come across a placard in honor of Richard, A Dutch diving instructor and much loved guide that discovered and made this place popular, and died for reasons other than diving during a vacation abroad. From the arch, leaving the cliff on the left side, the wall descends forming a canyon with a large cave at its base, where the first branch of orange coral hides. Across from its outlet, on the big sharp rock, another smaller one gives shelter to a good number of narval shrimp (commonly known as “prawn”). Go over the cliff and rise above a large group of rocks to an overhang where the second branch of coral grows, before beginning your return back to the surface where the maype welcomes you with a warm coffee or thee.